CHICAGO (Reuters) - Top NFL draft prospect Laremy Tunsil tumbled down the list on Thursday before being selected by the Miami Dolphins with the 13th pick of the first round following a controversial video posted on his Twitter account. Just minutes before the National Football League Draft began, the powerful tackle from the University of Mississippi was shown wearing a gas mask and smoking something through a bong. Tunsil later said his account had been hacked, but the damage was done and teams seemed to shy away from the player who had been expected to go near the very top of the draft. "It was a mistake. It happened years ago," Tunsil, who did not fail a drug test at Mississippi, told the NFL Network about the video. "Someone hacked my Twitter account." Tunsil said he found out about the video just before the start of the draft. "I did not know about it at all, I found out about it when I got to the Green Room," Tunsil said. "I don't know who it was, I ain't going to point any fingers or name any names." Tunsil has been involved in other off-field controversies, most recently when his stepfather sued him this week claiming the player attacked him physically and defamed him. Tunsil claimed he was only protecting his mother. Tunsil, who may have lost millions of dollars because rookie salaries are based on draft position, vowed to prove himself on the gridiron. "It's a crazy world, things happen for a reason. 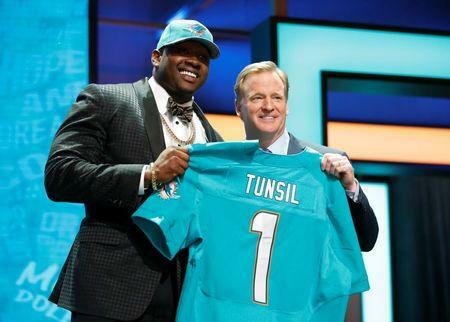 I'm glad to be in Miami," Tunsil said. "I'm going to show everyone what kind of person I am. I'm going to give it everything I got." Two offensive tackles were taken ahead of Tunsil, Notre Dame's Ronnie Stanley with the sixth pick by the Baltimore Ravens, and Michigan State's Jack Conklin, taken eighth by the Tennessee Titans.